Melissa Cartier: Pinterest Halloween Recipes Tested | Part TWO! 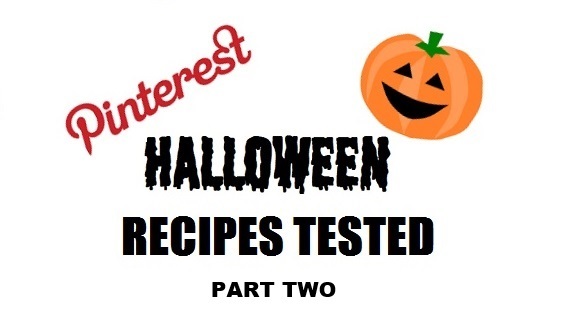 Pinterest Halloween Recipes Tested | Part TWO! It's that time of year again. Halloween! I decided to test out some more Halloween themed Pinterest recipes for you. To take a look at last year's recipes, click HERE. Spoiler alert: All of these recipes turned out great (in my opinion) but there was a fifth recipe that didn't work out which I tell you about below. These are great options if you're looking for a cute and Halloween themed treat to bring to work, school or to your child's school or daycare. They are also great options if you're nervous about Pinterest failing you horribly because I've done all the work for you. This was the messiest project of the bunch but Thomas loved them so I guess it was worth it. I had just picked up the really inexpensive food colouring from the grocery store baking section so it took a lot of yellow and red food colouring to get the marshmallows to look orange. Once I added the rice crispy cereal it muted the orange quite a bit so my advice would be to either a) invest in better food colouring, b) commit to pouring a lot of food colouring into these, c) or just embrace the really muted orange colour and pretend it was on purpose. I chose option C.
The directions also said that in order to role these into balls she had to cover her hands in vegetable oil to prevent the balls from sticking but that just seemed weird. I had learned from making granola bars that if you just wet your hands it'll prevent sticking so I just made sure my hands were damp when I rolled the balls. I think that muted the orange colour even more if I'm honest but that's fine. I prefer that to a layer of vegetable oil. I didn't have rolos so I just used chocolate chips as the stem and I think they worked out. These were a messy project but it would be fun to get kids involved and rice crispy treats are always a hit with the littles so I give this one a thumbs up! I'm a sucker for white chocolate so this one was my personal fave. A few tips that I want to share. The recipe I found said to melt the white chocolate in the microwave but I used the double-boiler method instead (read how to do that here). White chocolate can be really finicky and it's easy to ruin so I didn't want to risk it. Also, the mini pretzels that I bought ended up being bigger than the ones in this recipe so the eyes didn't sit on the top two holes, they fell through. So, I dipped the pretzels, then did one layer of mummy strips. After letting it sit for a second I placed the eyes on them and then finished them off with more white chocolate strips. The end result was pretty white chocolate heavy compared to the typical chocolate covered pretzels but in my opinion they were delicious. The recipe also said to let the mummy completely cool between putting the eyes on and putting the strips on but who has the patience for that? I definitely didn't let it completely cool and they worked out well. I was going to do a second pretzel from this recipe, the Pumpkin Pretzels. The Pumpkin Pretzels DID NOT WORK and I'll tell you why. My inexpensive food colouring was water based and since water causes white chocolate to seize, I couldn't die the white chocolate orange. I thought this would be a perfect addition to the menu because I already had the pretzels, the green candies and the white chocolate but I had to nix it. If I had wanted to go buy oil based food colouring or orange melting chocolate I could have made these but I really didn't want to. This recipe is not nut free because of the slivered almonds. I know a lot of schools are peanut free environments but if they are also tree nut free, you'll want to substitute the almonds. One substitution would be to buy a bar of white chocolate and cut it into slivers. If you have any other suggestions please leave them in the comments for any nut free mama's. I have a tree nut allergy but it's not severe (luckily) so I was able to make these (I also didn't bring these to a nut free environment. I just wanted to specify). These were pretty straight forward and don't involve any extra instructions. They are just cookies with icing and marshmallows so as long as you like all the ingredients you should be good to go! They were a little messy to make and a little more time consuming but I think they turned out cute. This was a last minute addition to the menu after the pretzel pumpkins didn't work out. These were the easiest to make and I think they are super cute. Aside from hershey's kisses being a little pricey I think these are a perfect option if you're looking for a last minute treat to bring somewhere! I had some leftover white icing in my fridge from Thanksgiving so I turned it orange and then I used some pumpkin sprinkles from a halloween mix as my hat buckle. I hope this inspires you for any upcoming Halloween parties you are attending! There is nothing more frustrating than buying a bunch of ingredients to try a Pinterest recipe only to have it not work. Especially if you're on a time crunch and are attending a party that same day! Let me know if you try any of these and if you do, tag me on instagram so I can see! @melissa_cartier! Happy Halloween!